Don't be reactive with your health, be ProActive! ProActive Chiropractic & Wellness is an evidence-based, patient centered practice. Our mission is to universally promote optimal wellness throughout the community by encouraging patient education, successful relationships, and individual growth. We utilize a well-rounded, individualized approach to patient care. The ProActive approach targets the most significant biomechanical dysfunctions, resulting in the most profound improvements. We focus on eliminating pain, injury prevention, improving function and performance with the most cutting edge manual therapy techniques and rehabilitative exercises. ProActive has a true passion for helping patients reach their goals. We work hand-in-hand with other medical providers to ensure our patients receive the most advanced, most effective care available. Our greatest reward is returning patients to their active, pain free lifestyles in the shortest timeframe possible. At ProActive Chiropractic & Wellness, patients benefit from chiropractic manipulation (adjustments), soft-tissue techniques (Active Release Technique and Post Isometric Relaxation), Kinesio Taping, dry needling, nutritional advice, therapeutic rehabilitation, and dynamic neuromuscular stabilization. Our services are often covered by your health insurance. We are in-network with and accept Blue Cross Blue Shield and Scott & White, as well as Medicare! Massage therapy does more than make you feel good! It can actually help your body achieve balance and health. Massage therapy offers a natural treatment approach which actually relieves musculoskeletal pain for many patients. Our chiropractic office provides specific massage and muscular therapy that is complimentary to their chiropractic care. Active Release Technique (A.R.T.) is a patented, state-of-the-art soft tissue system/movement based technique that treats problems with muscles, tendons, ligaments, fascia and nerves. The goal of A.R.T. is to restore optimal texture, motion, and function of the soft tissue and release any entrapped nerves or blood vessels. Here at ProActive Chiropractic & Wellness, we strongly advocate active lifestyles and preventative measures to avoid injuries and enhance the quality of life. In the event of an injury, we use innovative and individualized programs to assist in alleviating pain, stabilizing the injury and regaining strength in the area. For our complete services click here! A few months ago I tweaked my back while unloading something heavy out of the back of my truck. I heard a snap and went to the ground instantly not being able to walk...or even move. I called Jason. Jason rushed to my house and adjusted me there in my garage. Afterwards, I was able to stand up and walk unassisted into the house. After two more adjustments in that next week, I was able to get back to daily life without any issues. I had been having neck pain for about a month. I contacted Dr. Jason Allen and after the very first visit I noticed an improvement. My neck pain was almost gone. I was so happy. Not only did he take the time to personally listen to my concerns, but he began treating me with exercises, stretches & massage techniques that has proven to eliminate my pain. I was seeing a medical doctor who prescribed medication & after finishing the dose my pain was right back. To my surprise his plan of action has proven to be the proper fix. Dr. Allen is remarkable. It’s nice to see that his passion in his eyes & his goal to take care of you right away. His professionalism is spot on. I've had SI and rhomboid issues for several years now. 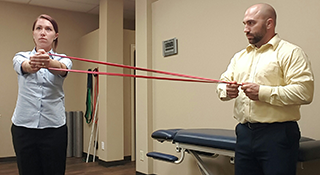 Dr. Allen has been able to adjust, and realign, my hips, and help work out my rhomboid issues. He's helped me get back into certain exercises I could no longer complete before I was his patient. With all the pains that come with being pregnant, back pain is one that I could take control over. When I went to see Dr. Allen, I was nervous. I had never thought of going to a chiropractor when I was going through my first pregnancy. But he was calm and assured me that it would be fine and talked with me the entire time. After it was all done, I left happy and feeling good, returning every few weeks to get adjusted.